Height: 85 cm / 33 in. Materials: papier-mвchй, foam plastic, wood, metal wire, fabric, glass furniture. First presentation - January 25, 1990, Concert Hall "Enthusiast", Moscow. 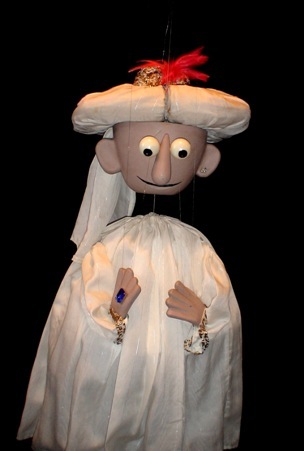 Oriental Magician is a transforming puppet with many original tricks. The puppet has moving nose, eyes and tongue. 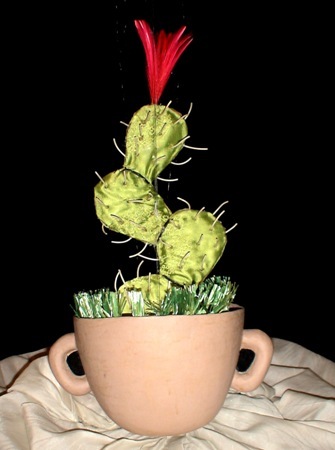 Oriental Magician transforms into a pot with grass and cactus in bloom. See PHOTO ALBUM of ORIENTAL MAGICIAN.